Director, writer, and actor Mel Brooks is the king of parodies. No matter how many modern films come out satirizing horror or romantic comedies, no one can do it like the master. Best known for transforming Mary Shelley's tale of Frankenstein into a classic comedy, Brooks does so again with Brahm Stoker's Dracula. 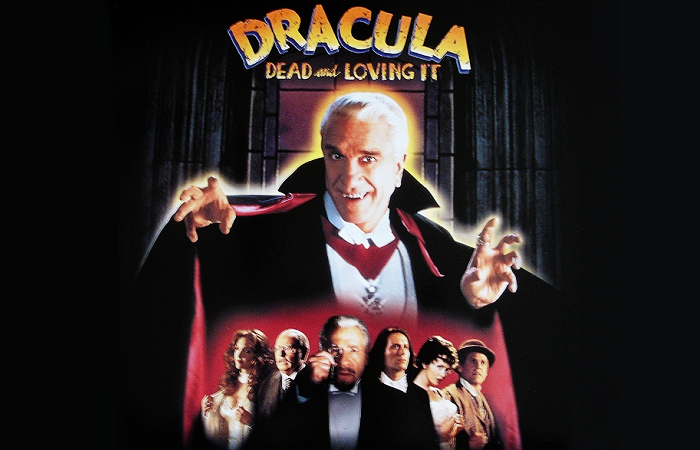 Taking creative liberties from the classic tale, solicitor Thomas Reinfeld (Peter anacNicol) becomes a insect-eating delusional ward to Dracula (Leslie Nielsen), a vampire - obviously. They journey from Transylvania to London where he has bought a castle. Crossing paths with his new neighbors Dr. Seward, his daughter Mina, her fiance Jonathan, and his ward Lucy, Dracula's true identity is closed in on by vampire hunter Van Helsing. Young Frankenstein, starring Gene Wilder and Peter Boyle, is one of Brook's most popular parodies. The 1974 comedy fares a little better with the production value than here with Dracula Dead and Loving It, but still, the cast is hilarious. Exchanging Gene Wilder, Madeline Kahn, and Peter Boyle, you get Leslie Nielsen, Amy Yasbeck, Steven Webber, and Harvey Korman. Even the good man himself Mel Brooks join the cast as Inspector Van Helsing, who is not as gung-ho and adventurous for taking down Dracula as we normally see his tale played out. Brooks is famous for taking well-known characters and turning them on their ear, as well as producing original works that are purely wild and zany. Here he does the same with great exaggeration. Famous lines are altered for laughs. He pokes fun at the colloquial English terminology. Jonathan Harker and Van Helsing are convinced Sewards' ward Lucy has been turned into a vampire. When they try to stake her, he has to be realistically dowsed in blood. And, that's just the start! Dracula Dead and Loving It is one of the many strange movies my grandmother played for me and my sister when she watched over us as children. While Brooks' filmography is certainly familiar to true movie buffs or comedy-aficionados, it's been wonderful and refreshing to see the cult following this 1998 flick seems to have on places like tumblr with movie lovers my age. This movie isn't as well-known as his other works, but it's got all the laughs to make it a worthy gem.